Membership in the Society is open to individuals or organizations demonstrating active interest in the field of reproduction and related areas. Membership is conferred upon approval by the Membership Committee and is activated upon payment of dues. All members receive electronic access to the Society's publications and are invited to the annual and special meetings of the Society. "Any individual who has demonstrated professional competence in and made scientific contributions to the field of reproductive biology shall be eligible for Regular Membership in the Society" (Bylaws Article V, Section 1(a)). Reduced registration fees to attend the Annual Meeting. Reduced publication charges for publishing in Biology of Reproduction (when serving as Corresponding Author). Hold office, elect members and officers, and change the Bylaws (Bylaws Article V, Section 2). Nominate others and be nominated for SSR Awards. Serve as voting members of committees (Bylaws Article XI, Section 4). Regular membership in the Society shall be conferred by the Membership Committee on the basis of scientific productivity and continuing interest in the field of reproduction or related areas. A nominee must have a doctorate or demonstrate its equivalent in scientific accomplishments. The Bylaws are inconclusive regarding voting privileges on committees. Individuals who are research associates or senior technicians engaged in research activities in the area of reproduction. Individuals interested in the science of reproductive biology but not actively engaged in research. Individuals engaged in full-time clinical practice who have not published and do not expect to publish in the area of reproduction. SSR membership provides the opportunity to interact with established scientists and with other trainees in the field of reproductive biology. Career opportunities, new scientific ideas and collaborations, and lasting friendships are forged through these interactions. Eligibility for Travel Grants and Merit Awards. Special events at the Annual Meeting, including the Trainee-Mentor Luncheon and Trainee Forum. Access to SSR's Trainee Affairs Placement Service. Nominate a qualified individual for a Trainee Mentoring Award. Represent the Trainee Membership on the Board of Directors. any committee on which they are invited to serve (as approved by the SSR Board of Directors at the 2012 Summer Board Meeting). Be appointed co-chair of an Annual Meeting session (see Trainee Affairs page for details). Any student (undergraduate, graduate, or postdoctoral) in training in the field of reproductive biology is eligible for Trainee Membership. Trainee applicants must provide a signed letter from their major professor or mentor verifying trainee status; the letter may be on department letterhead, or they may use the Mentor Signature Form. When a trainee member no longer qualifies for Trainee status, he/she may apply for Regular or Associate Membership. "Any philanthropic individual, organization, corporation, or foundation which contributes substantially to the support of the Society may, by action of the Board of Directors, be admitted to membership as a Sustaining Associate" (Bylaws Article V, Section 1(f)). An individual or organization connected to or interested in the advancement of knowledge about human and animal reproduction is eligible for Sustaining Member status. Please contact the SSR Business Office for more information on the levels and benefits of Sustaining Membership. "Regular Members in retirement, with at least ten years of regular membership in the society, shall be eligible to petition the Executive Director to have the Board of Directors grant them emeritus status" (Bylaws Article V, Section 1(b)). The Society's Emeritus Members are a source of wisdom and intellectual vitality. Any member of SSR with a minimum of ten years' Regular Membership in the Society, and who is retired or about to retire, is invited to become an Emeritus Member. All requests for Emeritus Membership should be sent to the Executive Director, Saima Hedrick. Emeritus Membership must be renewed on an annual basis. "An individual who based on his/her overall impact on science is a Hartman awardee" (Bylaws Article V, Section 1(c)). Any recipient of the Carl G. Hartman Award who is not currently an SSR Member is granted Honorary Membership. Affiliate membership in the Society for Reproductive Biology has been arranged to encourage closer links between SSR Members and their Australian and New Zealand colleagues. Visit our Affiliate Membership page for details. 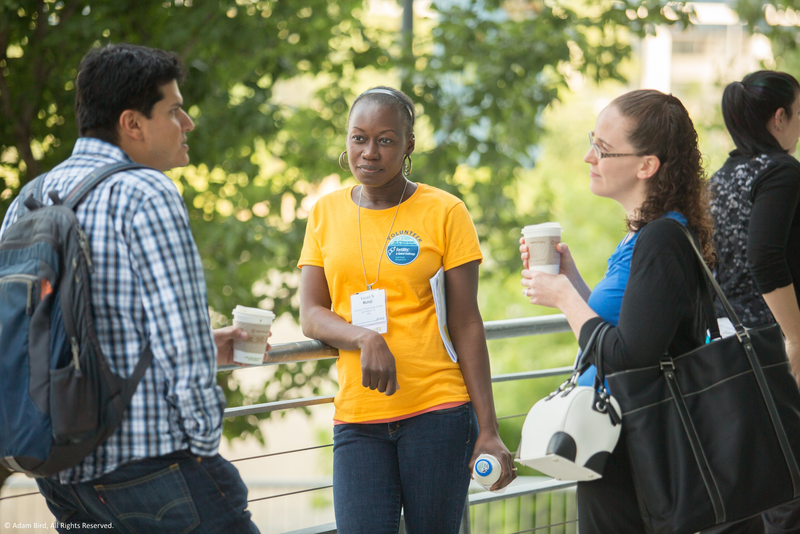 Members meeting between sessions at the 2014 Annual Meeting in Grand Rapids, Michigan. No matter what career stage you are in—in school, at a lab, or clinical—there is a membership option for you. The SSR is committed to preparing the next generation of investigators in the reproductive sciences. Learn more about the Bulk Trainee Membership Program.